The name originates from the place Findlater, first recorded in the Exchequer Rolls in 1246. The name is Norse, fyn being white and leitr cliff, so called because there is quartz in the rock. The position of Findlater Castle is on a tiny peninsula which sticks out into the North Sea, with a sheer drop of more than fifty feet to the rocks and sea below. Findlater or Fynletyr is on the coast of Banffshire, a few miles west of Banff itself. King Alexander III, anticipating in the early 1260s an invasion by King Hako of Norway, ordered that the royal castles of Aberdeen, Banff and Cullen and the baronial castles of Dunnottar, Slains, Dundarg, Boyne and Findlater should be inspected and repaired. There would appear to be no remains of that thirteenth century castle, as the Vikings subsequently occupied the site for some time. Sir John Sinclair of Findlater, who died in 1411 at the battle of Harlaw, which ended the Earl of Ross’ rebellion, is probably the builder of the present structure. The castle is clearly modelled on Roslyn, which was the principal stronghold of the Sinclair family. 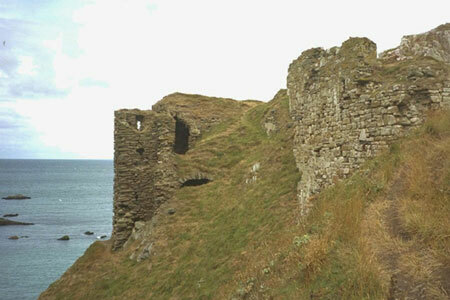 Thus Findlater Castle would date from the end of the fourteenth century, being built after Roslyn.